Russia's top security official on Thursday offered the Philippines access to an intelligence database to help it fight crime and militancy, and training for the elite forces assigned to protect President Rodrigo Duterte. Nikolai Patrushev, the secretary of Russia's Security Council and Vladimir Putin's top security adviser, made the offer during a meeting between Russian and Philippine security officials in Davao, where he was visiting Duterte at his home city. In an interview with Reuters last week, Lorenzana said there were "very strong" links between Islamic State and militants in the Philippines. 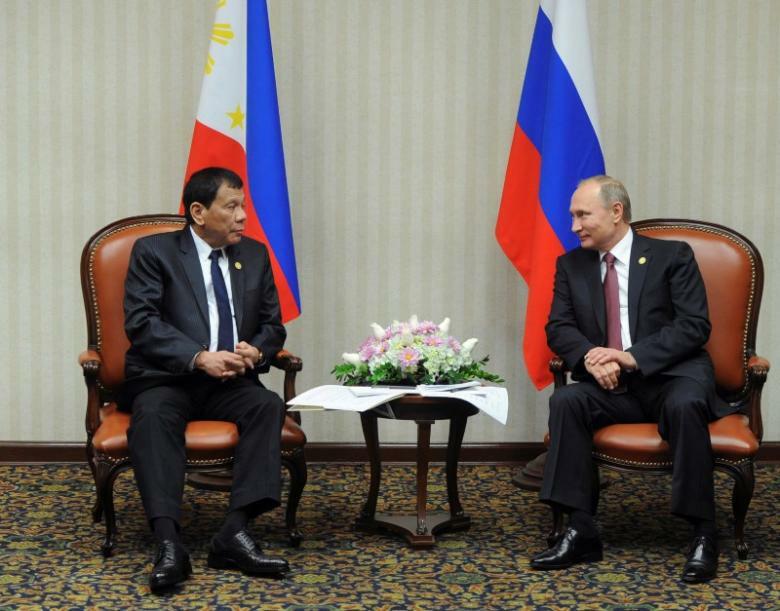 Patrushev's trip underlines Russia's intent to capitalize on a radical recalibration of foreign policy under Duterte, who harbors resentment of the Philippines' deep-rooted ties to the United States. Duterte has made strong overtures towards China and Russia. He praised Putin's leadership when he met him at an international summit late last year. He also he talked at length to Putin about what he called U.S. "hypocrisy". Lorenzana said security officials from both sides also discussed law enforcement cooperation, including anti-piracy and anti-narcotics exercises by coastguard and police. The two countries were working on a military technical cooperation agreement, he said, and Russia offered to provide enhanced training for troops protecting Duterte. Duterte will visit Moscow in May. "We are keen on signing a defense cooperation agreement," Lorenzana said of that trip. Lorenzana said last week Russia was interested in selling military equipment to the Philippines, like drones, helicopters, rifles and submarines.